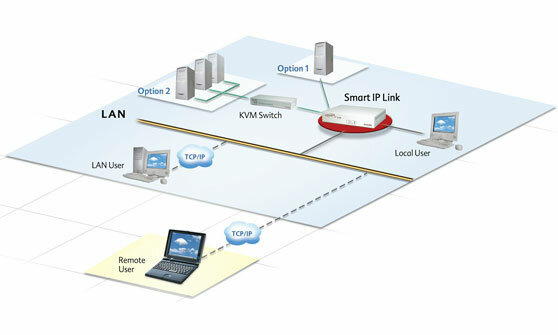 The Smart IP Link is an economical, hardware-based, remote KVM access solution. It is uniquely tailored for users and IT professionals who wish to add a remote access link to their computers or servers at a minimal investment, without having to compromise on security, quality and functionality. With the Smart IP Link you can easily and securely manage a single computer or dozens of servers, from any location using standard LAN, WAN or Internet connections. The Smart IP Link offers a wealth of features including highest security standards;128 bit SSL encryption, Java based operation as well as remote control of different serial devices, superior video and mouse synchronization and user- friendly functionality - all for an unrivaled price-performance ratio. Dimensions Product - 43Hx175Dx213Wmm / 1.69Hx6.89Dx8.38W"
Shipping - 115Hx255Dx350Wmm / 4.52Hx10.0Dx13.78W"